René Magritte took drawing lessons in 1910. In 1912 his mother drowned herself in the River Sambre. His first paintings were created around 1915 in impressionistic style. He studied at the Académie Royale des Beaux-Arts in Brussels (1916-1918) where Constand Maltald was his teacher. Most of his works from 1918 to 1924 were influenced by Futurism. 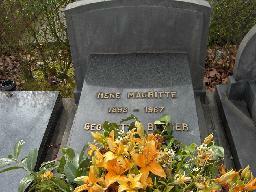 In 1922 he married Georgette Berger (they had first met in 1913). After working as a draughtsman and as an advertisement designer he was able to concentrale on painting in 1926 after Galerie le Centaure in Brussels contracted him. From that moment he produced surrealistic paintings. After his first exhibition in Brussels failed he moved to Paris where André Breton became a friend. In 1930 he returned to Brussels where he ran an advertising agency with his brother Paul. He had no children with his wife and she had an affair with his friend Paul Colinet at the time he got involved in London with the model Sheila Legg (and possibly fell in love with her). Georgette continued her affair and even asked for a divorce. In 1940 he fled his home for France and he stayed there for three months. After he returned to Brussels he reconciled with Georgette. After the war he produced false Picasso's, Braques and Chiricos to earn a living. In 1947 his work was succesfully exhibited in New York. After 1948 he returned to painting surrealistic works in the style he used in the 1930s and he produced several large works for his patron Edward James during the 1950s. In the 1960s his reputation as a painter rose strongly, but he died in 1967 of pancreatic cancer. 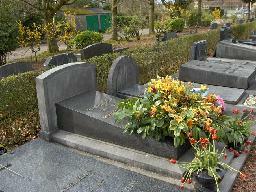 The grave of René Magritte at the cemetery of Schaerbeek, Brussels.